San Francisco de Milagro, also known as Milagro, is an Ecuadorian city; Cantonal capital of Cantón Milagro and the third largest and most populated city in the Province of Guayas. Known as "The Land of Pineapples", it is 45 km away. From Guayaquil. It is settled between 8 and 15 m.s.m. .. Its average annual temperature is of the order of 25 ° C and its precipitation is 1361 mm. Milagro has achieved national recognition for its high quality pineapple crops and of which there are two monuments. The first is a composition of stainless steel 8 meters high, located at the intersection of the avenues September 17 and Chirijos. 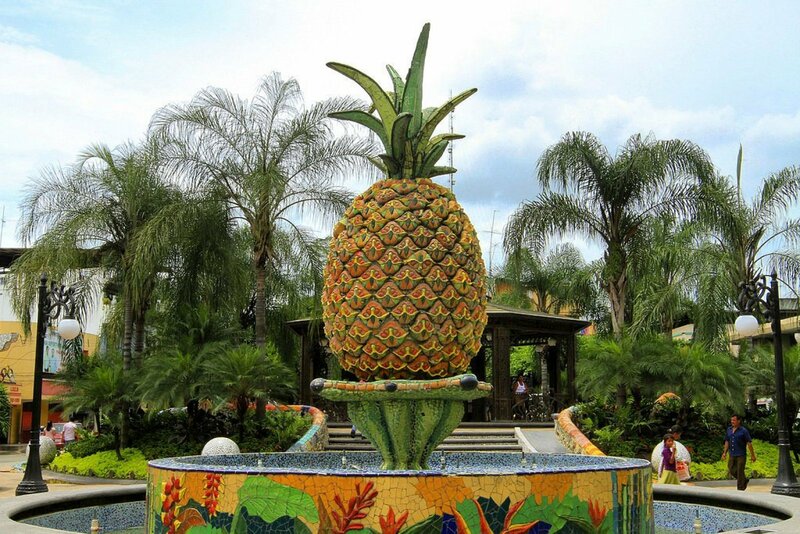 The other pineapple sculpture is on the Central Plaza, it is made with modeled ceramics and hand painted by the Quito artist Juan Sánchez. Here we also find a fountain adorned with allegories about the city of Milagro, two roundabouts of colonial style, an illuminated pond and several gondolas. Milagro is one of the cities with the greatest progress in the province, due to its commercial intensity and the development of its agro-productive industry, among which the Valdez Sugar Industry stands out, enjoying a very good position in the national and international market in the production of sugar and its derivatives, Ecoelectric which is a company dedicated to the production of electrical energy from the bagasse (waste) of sugarcane. There is in Milagro, given the benefits of its climate, a large number of nurseries where a wide and exquisite variety of ornamental plants are grown. In view of the variety, beauty and low costs of the plants, these nurseries have a high demand and acceptance both nationally and internationally. Most of the nurseries are located on the Milagro-Naranjito highway. It also has plantations of pineapple, cocoa, banana, among others. Access to Milagro from the city of Guayaquil can be done in two ways: the first leaving Durán by taking the Duran-Yaguachi road, reaching the junction of this road with the road to Milagro; the other alternative is leaving Durán taking the Durán-Boliche highway until taking the Km.26-Milagro road. These roads are wide and in good condition, as they are paved and paved. The bus cooperatives that have this canton as destination are: Rutas Milagreñas, Expreso Milagro and Ejecutivo 17 de Septiembre, have spacious and modern units, in excellent conditions. The trip lasts forty-five minutes approximately from Guayaquil. Julio Viteri Gamboa Museum: Located inside the Visaltur Tourist Complex, ceramic pieces that were found by the initiator of archeology in Milagro, Julio Viteri Gamboa, who together with Emilio Estrada Icaza discovered the Milagro-Quevedo culture, are exhibited here. Monuments to the Pineapple: In the city there are three monuments that represent the pineapple, the main agricultural product of the canton. The first is located at the intersection of the avenues of September 17 and Chirijos, is a metallic structure of 8 meters high, has 240 led lights, a water source and planter. It was inaugurated in 2005 by the mayor Francisco Asan. Monument to Zafrero: Sugar cane is one of the economic engines of Milagro. The monument to the zafrero was built with ferrocement and ceramics by the sculptor Juan Marcelo Sánchez. It is located in the north of the canton, on the Y, where Chirijos Avenue and Colombia Street meet. It was opened in 2013 by the mayor Francisco Asan. Monument to the Hummingbird: This work of art represents the diversity of nurseries and flora of the canton. It is located on the road to Naranjito, at the intersection of Colon Avenue and Andrés Bello Street. It has led lighting and planter. It was opened in 2018 by the mayor Denisse Robles. Train Station: It is located at the intersection of Garcia Moreno Avenue and 9 de Octubre Street. The terminal, of 650m2, was rehabilitated by Ferrocarriles del Ecuador EP after 20 years of inoperability and abandonment. The station is part of the "Tren de la Dulzura" route, which runs from Duran to Bucay, has customer service areas and tourists, multipurpose room, Train Museum, Train Shop and Train Cafe. Pineapple Monument.- Milagro has achieved national recognition for its high quality pineapple crops and of which there are two monuments. The first is a composition of stainless steel 8 meters high, located at the intersection of the avenues September 17 and Chirijos. The other pineapple sculpture is on the Central Plaza, it is made with modeled ceramics and hand painted by the Quito artist Juan Sánchez. Here we also find a fountain adorned with allegories about the city of Milagro, two roundabouts of colonial style, an illuminated pond and several gondolas. Tourist center Las Cataratas.- It rises in the Las Maravillas sector of km 3 ½ of the road Milagro - Mariscal Sucre. It is based, mainly, on the infrastructure that dammed the waters from the Milagro River, it consists of an attractive fall where the surrounding vegetation and the extensive plantations of the area are appreciated, that use the water of the dam for its irrigation. Nursery path .- About 150 nurseries of ornamental plants, located at the height of km 3 via the Milagro-Naranjito road, are an excellent option for agrotourism in the sector. We recommend your visit, for sure it will take something of your liking. Forest Forest El Bosque.- It is a charming place, ideal for family recreation, where you can taste typical dishes and enjoy green areas with volleyball courts, golf course, swimming pool complex and children's games. It is located on Via Milagro - Naranjito.